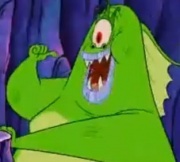 Sea Monster – From SpongePedia, the biggest SpongeBob-wiki in the world! The Sea Monster is a character that appeared in two episodes, SpongeGuard on Duty as sea monster that study Science and Literature and 20,000 Patties Under the Sea when SpongeBob, and Patrick fall into the abyss. The Sea Monster has been asleep for 79 years. He ordered 640 Krabby Patties because his last meal was 79 years ago. The Sea monster is voiced by lead singer of hard rock band, 'KISS', Gene Simmons. The sea monster at SpongeGuard on Duty is looked like Sea Dragon, In the next appearance, Sea Monster is a very tough male. He ate Plankton because he thought he was a chocolate éclair. He looks like a sea serpent in SpongeGuard on Duty. In his 2nd appearance, he has one eye with a crown-like spike on it, purple lips, sharp teeth, a big tounge, he has a huge fin on his head to back, green scales, a yellow belly, big arms and legs, and big tail. He is also very big and fat. "You know, we sea monsters have made great strides in the fields of science and literature." "I've been asleep for 79 years." This page was last modified on 4 April 2018, at 19:15.